Missy Masters is mystical crime-fighting world-saving superhero. She inherited her powers of controlling shadows from her grandfather who was known as the superhero Mr. Mystic. It’s a daunting prospect and just fitting into the costume presents a challenge. But there’s more to being a superhero than wearing a costume and having powers. Learning to harness and control those powers is vital if Missy really wants to take up the mantle and carry on the role of Mr. Mystic, so she heads off to China to learn from the same wise man who taught her grandfather. The book is divided in two parts, being split between San Francisco and China. In San Francisco, Missy is faced with a series of mystical walls that have been appearing and she is the only one who can erode the walls with her powers. This part of the story can be exciting and pretty much what the modern reader is looking for when looking for a superhero story. Though the mystical elements have strong shades of Marvel Comics’ Dr. Strange, it is unique enough to appeal to today’s audiences. The story-line in China is a different story. Literally. Not only is the part of the story in China separated by distance, it is also separated by time. Chapters are divided by “Now” and “Then” headings. Not too unusual — plenty of books have flashbacks or parallel story-lines running. But in the past, Missy was a boy; Jian Huo. And late in the book we learn that there’s much more to Missy Masters than simply trying to become a superhero. In small sections, this book is really fun. But it’s very possible that it’s the sort of book you will put down, and when you come back to it, ready to start the next chapter, you won’t have a clue as to what’s going on. The jumping around in time, storyline, and even genders really complicates the story – unnecessarily. This change in narrative also prompted a change in energy. The modern sections were active and adventuresome. The past moved slowly and patiently. This pace was reflective of the period and the story(stories), but was also sort of annoying. I appreciated the Chinese traditions and culture here. This sort of mysticism is fascinating to me. I only wish the book had been able to hold my interest. Looking for a good book? 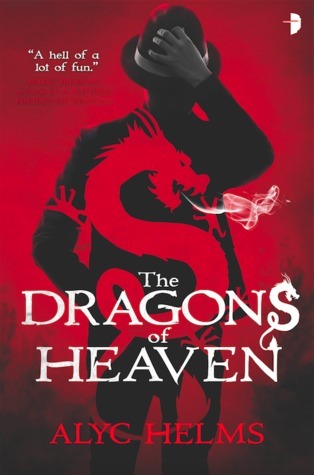 The Dragons of Heaven by Alyc Helms is two interesting stories trying to be one interesting story and not quite succeeding.